The retail box of the Optimus G is barely bigger than the handsets itself. It packs a charger and USB cable, a single-piece headset and a couple of NFC tags. The headset has flat cabling and cool silver earbuds. The last thing to find in the box is a SIM eject pin. LG could have wrapped it instead of simply chucking it in but it's no big deal as long as it doesn't get lost during the factory packaging. LG doesn't supply a MHL adapter enabling TV-out, but none of the competitors has one bundled either. At 131.9 x 68.9 x 8.5 mm, the Optimus G is a tad more compact than its main rival, the Galaxy S III, and almost the same size as its predecessor, the Optimus 4X HD. 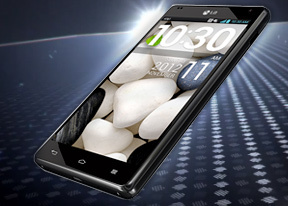 The Optimus G fits a display with a wider aspect ratio of 16:10 in virtually the same body as the Optimus 4X HD, thanks to the so-called Borderless design that minimizes the screen bezel. The Optimus G weighs 145g, which is 12g more than the Galaxy S III. It's not a difference that will be badly felt in daily use. The LG flagship is pleasantly solid, but the straight-etched sides don't allow as good grip as the curvy Galaxy S III. The LG Optimus G styling isn't exactly new - you can spot the Prada influence that spilled down to the L-series as well. What's more important is that the angular design is an emphatic departure from the organically curved Galaxy S III and HTC One X. The design is free of embellishments and that's the right approach to a device of this size. Clean lines and straight angles make a simple but strong statement. Gone is the textured back of the Optimus 4X HD, which now may even be considered tacky when compared to the smooth glass covered rear of the Optimus G.
By the way, the finish has nothing to do with what Apple used on their iPhone 4 and 4S. It's actually more akin to Samsung's hyperglaze coating. What's different here is the underlying pattern called "Crystal Reflection" finish. It is more prominent on a black handset than a white one: because the glass is polarized, the pattern shifts depending on viewing angle and lighting. Still, the LG Optimus G, just like its S III rival feels like an all plastic device (if we didn't know it from the LG press materials we'd have a really hard time telling that the back panel is made of glass), which to many isn't quite great for a flagship device. LG made it quite clear that with all the antennas the smartphone packs plastic and glass was its only choice, so you should think of this as the price that needs to be paid for having the monstrous specs in such slim body. Just don't expect to wow anyone by showing them the sides or the back of your Optimus G - leave that to the screen at the front. Our extended preview was based on the black model a while ago, and we're lucky to have the white Optimus G for this review. The front is occupied by the huge 4.7-inch True HD-IPS+ LCD display of 768 x 1280 resolution. Whatever color version you choose, the screen bezel will be always black, unlike the Optimus 4X HD, the Galaxy S III or the iPhones. There is a very thin metal frame running all around the phone's body where the screen glass and the rear cover meet. It is one of the few subtle accents in the Optimus G's design. Now let's take a closer look around. Above the screen we find the earpiece, a couple of hidden sensors and the 1.3MP video-call camera. There is a small status LED right next to the LG logo. Below the 4.7-inch display is the familiar layout of capacitive controls: Back, Home and Menu keys. All three of them are haptic-enabled and pleasantly backlit in white (with a dedicated setting for the backlight duration). The left side of the phone features the microSIM compartment (you'll need the SIM eject tool to open it) and the volume rocker. It is nicely shaped to accommodate its other role: launching the Quick memo app. You no longer have to press both keys simultaneously, which was rather uncomfortable - pressing right in the middle will do the trick and that's where the volume rocker has a very subtle, but convinient hump. The right side has just the Power/Lock key. The top side of the Optimus G is different depending on the region you are in. Our unit came straight from South Korea, hence the T-DMB tuner and telescopic antenna. The Europe-bound phones won't have those. The 3.5mm audio jack along with the secondary mic are also on top. The bottom hosts the MHL-enabled microUSB port and the primary mic. There are a couple of screws that secure the back as well. The 13MP camera lens protrudes from the back slightly, so the phone rests on it. The 8MP variant of the Optimus G has the camera flush with the surface. Just below the camera is the single-LED flash and diagonally opposite is the loudspeaker. The back cover is non-removable - that is to say, not designed to be user removable, but it can probably give in if you undo the screws. Under the cover is a 2100mAh Li-Po battery, developed by LG Chem and promising increased lifespan of 800 charge cycles. 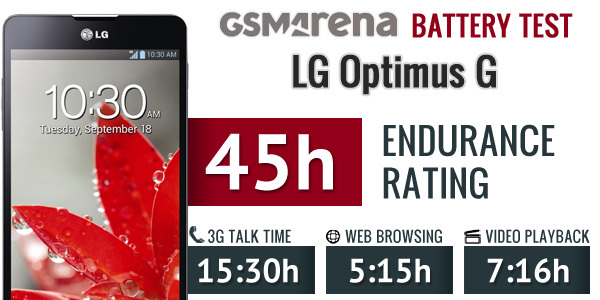 We ran our traditional battery test of course and the Optimus G achieved endurance rating of 45h. This means that if you were to use the smartphone for an hour of talking, an hour of web browsing and an hour of video playback per day, you'd need to charge it once every 45 hours.